Artists and intellectuals in Spain, including Mario Vargas Llosa and Pedro Almodovar, respond to the political standoff after the referendum for Catalonian independence. Even before the referendum, Peruvian-born Spanish Literature Nobel Prize winner Mario Vargas Llosa has called Catalonia's independence process an "illness that is spreading in Catalonia, absurd nonsense, an anachronism that has nothing to do with the reality of our times." Vargas Llosa is one of more than 1,000 intellectuals who published and signed a manifesto in September in the Spanish daily El Pais. The signatories criticize the Spanish central government's blockade politics and its reticence to enter into a dialogue on the Catalonia issue, but they also urged all Catalans not to participate in this "illegal, undemocratic and opaque" referendum. Signatories included Catalan director Isabel Coixet and Pedro Almodovar, songwriter Joan Manuel Serrat, writers Javier Marias, Juan Marse and Nuria Amat. Their engagement with the issue was not well-received by some. Isabel Coixet, whose film "Nobody Wants the Night" opened the 65th Berlin Film Festival two years ago, faced severe criticism from the separatist camp for her commitment to Spanish unity, so much so that she felt compelled to declare she was "not a fascist." The fact that the Catalan government has dismissed Catalan society's bilingualism and forced the exclusiveness of Catalan has led to a "systematic exclusion from institutions and cultural life of Spanish-speaking people engaged in the cultural sector," Cecilia Dreymüller told DW. The German literary critic, writer and translator has been living in Barcelona for the past 25 years. Catalan author Nuria Amat, who writes in Spanish, has long felt discriminated against. "Authors like me who oppose nationalism and don't write in Catalan are systematically censored and excluded by the Catalan cultural institutions, separatist press, book publishers and universities, she argues. There is a certain degree of "cowardice" among intellectuals and those involved with culture concerning open opposition to the aggressive mass of Catalan separatists," Basque philosopher Fernando Savater told the Austria Presse Agentur (APA) press agency. Dieter Ingenschay, a cultural scientist and expert on Spanish and Latin American literature, has many friends in Spain - including "independentistas." For many intellectuals, the past, and Francoism, "plays a large role in the independence debate," he says. Tenor José Carreras, one of the most famous nationalist artists, has what he calls a "great affection" for his little country. "And why should that be bad for Europe," he wondered in an interview with Austrian radio last year. At the start of his career, he was forbidden from using his Catalan first name, Josep, Carreras remembers, adding that he always felt he was Josep, even if all the world called him José Carreras. He is proud when people actually address him by his Catalan name, he says. Best-selling author Albert Sánchez Piñol, who wrote "Victus: the fall of Barcelona" and "Pandora in the Congo" is likewise pro-independence. The brutal force used by police against Catalan citizens who wanted to vote in the October 1 referendum has given new weight to arguments opposing the Spanish government under Prime Minister Mariano Rajoy. Rafael M. Mérida Jiménez, Professor of Spanish Literature and researcher at the Centre dona i literatura at Barcelona University summed it up as such: "As I see it, the central question is not 'independence, yes or no,' rather 'freedom of expression, yes or no,' 'police repression, yes or no.' I disapprove of a state that orders unwarranted police action, justifying or ignoring it." Between these two opposing poles is a third group, known as the Federalists. They see federalizing Spain, a process that would grant greater autonomy to the regions, as one possible alternative to independence. To do so, however, would require an amendment to the Constitution, something which has only happened twice since 1978. How things will carry on is something no one can predict. For those working in the arts, however, things are looking bleak, said Cecilia Dreymüller. "The social and cultural plurality of Catalonia that we once knew, particularly as seen in Barcelona, is in danger of going under. That has been in motion as part of a process begun by the government of Pujol [Eds. note: Jordi Pujol was the governing head of Catalonia from 1980 to 2003], one which is not stoppable. Many in the arts have already left Catalonia and others will continue to follow." "The argument that the referendum was against the Constitution is a serious one. But it cannot be the only one," said culture researcher Dieter Ingenschay. "I wish that the EU, although it doesn’t have a mandate to do so, would in any case step in as mediator between the two sides." It has been a year since Spain was plunged into political crisis, as the region of Catalonia held a referendum on breaking away from the country. The vote triggered a strong reaction from the government in Madrid and rippled across Europe. Spain has given Catalonia’s regional government five days to say whether it has in fact declared independence from Spain. 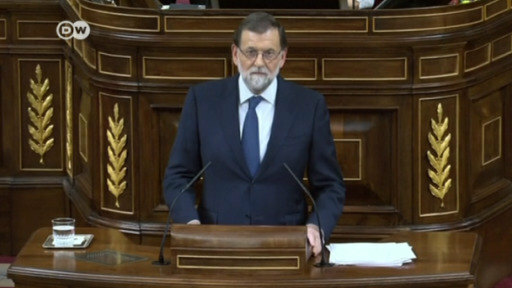 Spanish PM Mariano Rajoy has promised to do everything possible to prevent Catalan sovereignty.